I've traveled a lot with my two little guys. Sometimes my hubby comes along. Sometimes the dogs come along. It's always an adventure, usually with some stress and always with great memories. 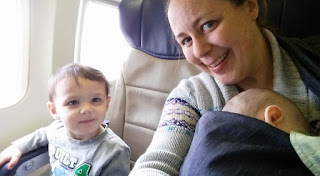 Because we're road warriors by now, I've got some tips for what you might expect on the road (and in the air) with kids. Since I'm often asked for my advice, I thought I'd put it here to have it as an easy reference. Before kid number two arrived, we flew everywhere. Hubby was traveling a bunch for work, so frequent flier miles were abundant. 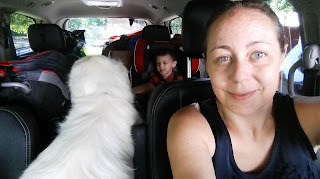 Since the second baby arrived, we acquired a mini van, and have been road-tripping like crazy. In the first year of his life the baby accumulated more than 10,000 miles in his car seat on family trips, flown on two round trip flights, and has been to 15 states. (Big brother went to an additional 4 states - including Hawaii, by air, and racked up 5,000 more road miles in the 2 years before the baby arrived). Load up on snacks and drinks, some new car friendly activities, and patience. Plan for it to take 1.5x the time of whatever the gps says. I breastfed both boys. Pumping and bottle feeding didn't work great for us on the road (or ever). Both babies liked to be held to eat and needed a chance to stretch, so we had to stop anyhow. They also weren't used to bottles so that didn't help matters. But they do make travel warmers, and your milk should stay good in a cooler for the duration of a drive, so you might try feeding the baby in the carseat. Just don't bank on ir (see my first point). Anticipate one long stop mid-day to stretch out. When they're a little older a nice mall play area & food court or Chick-fil-A are great options. Pack extra diapers. You think that's enough? Great, add a dozen more. Leave them handy in the car as they will be used often. Expect baby digestive troubles the day or two after driving. Being squished in a car seat messes up their digestion, as can a breastfeeding mom's strange diet of gas station burritos. If you have a lap baby, you need to get a boarding pass for the baby at the baggage check-in counter. If one of the adults you're traveling with has any kind of status: pre-check, priority boarding, whatever... get the baby's boarding pass attached to their ticket. Unless you're flying Southwest, then have that person scurry ahead with the bags and secure great seats for everyone. You'll get to board with family pre-boarding which nowadays falls somewhere between first class and the goats and chickens. There is a best way to deal with baby gear when traveling. Then there is the way we've done it. Car seats- take your pick. We generally check the car seat at the baggage check. They make big car seat bags that look like laundry bags you'd use in a dorm. Checking a car seat may invalidate its warranty so check with your manufacturer. It's better to gate check the car seat, but then you lug it through the airport. They make little rolling carriers for car seats that you can wheel through the airport and even strap the kid in. It's best to use an FAA approved car seat on the plane in the baby's own seat (that you paid for). Older than two and you need to buy the kid a seat on the plane. You can use the FAA approved car seat in the seat, or buy a CARES harness, an FAA approved adapter for the plane's seatbelt, or just let the kid sit. We often bring a stroller, but it is used mostly for carrying stuff not kidsI But if the stroller is more than 20 lbs you'll need to check it when you check your bags, so i suggest one of those frame bases that the car seat clicks in to or an umbrella stroller. You will need to get a special tag at counter at the gate for a stroller or car seat you plan to gate check. Buckle all the buckles on anything you plan to check. they can get smashed. If you will be traveling to a home where no kids live, and your baby sleeps in a crib, it's economically sound (and more convenient) to buy a cheap (or used - try Craigslist or local facebook garage sale sites) pack n play and keep it there (or resell it after one visit). One round trip with the extra checked item will more than cover the cost. Grandmas or other accommodating hosts may also find you a high chair or booster seat at a garage sale or on loan from a friend. Baby wear, y'all. It's better than a leash. You can baby wear through security if your carrier doesn't have metal parts. They will swab your hands and send you on your way. You can bring liquids and food through security for your kids. That includes pouch food, breastmilk, ice packs to keep the milk cold, formula, water to make formula, juice, whatever. Just let the TSA agent know - it's for the children. If they give you any problem - direct them to their own website. They might stick a little strip in the liquid and then into a machine to make sure you're not carrying contraband in the Kool-Aid. Alternately, bring a water bottle and those powder drink mix tubes, then fill up at the water fountain to save time at security. Nurse (or give a bottle or paci) on takeoff and landing to help baby's ears pop. You'll probably be asked to remove the baby from the carrier if he's in one. Please don't be shy about nursing or pumping on a flight. I know several flight attendant breastfeeding moms and they all do it. Go for it! Hope this helps. If you have any questions, leave them in the comments and I'll reply! Pre-order New Mom Comics Today! Have you been online in the last year? Then you may have seen these comics on Huffington Post, Upworthy, or shared on my facebook page! In honor of World Breastfeeding Week, we have a giveaway for you! Alison Wong is a friend I love to name drop (Have you used the Heinz Dip and Squeeze packets or the Orville Redenbacher pop-up popcorn bowl? Thank Alison. Remember that show The Big Brain Theory, hosted by Kal Penn? Then you saw Alison.). A decade and a half ago she was drawing comics for The Tech, MIT's campus Newspaper, and I was her editor. Now we are both moms and may or may not be wearing clean pants! Time flies, so does food off a high chair! For this reason, I am so excited for the opportunity to give out copies of her book. Perfect if you are an expecting, new or experienced parent, or love kids. They make great gifts too! 100+ pages paperback, 55+ comics, with some color. Currently taking pre-orders, $15 plus s&h. Delivery in Dec before the holidays.